Movement handle included in the skirt. Use the LowerLeftSleeve and LowerRightSleeve to adjust the drape of the sleeves. Please us the "Use this UV" in the Surface tab if making your own textures, otherwise the frill will not look right. I think I am going to cry--I have been looking for just this kind of thing! Thank you! 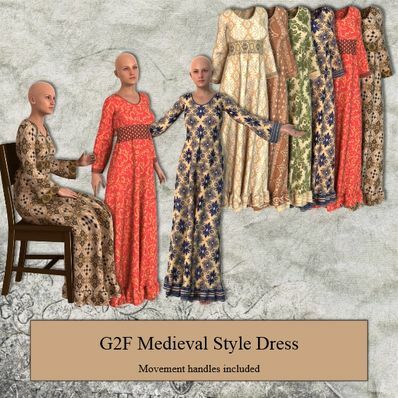 Lovely dress, thank you for the UV to make our own textures, you are so generous with your talent. Great dress! Thank you so much.